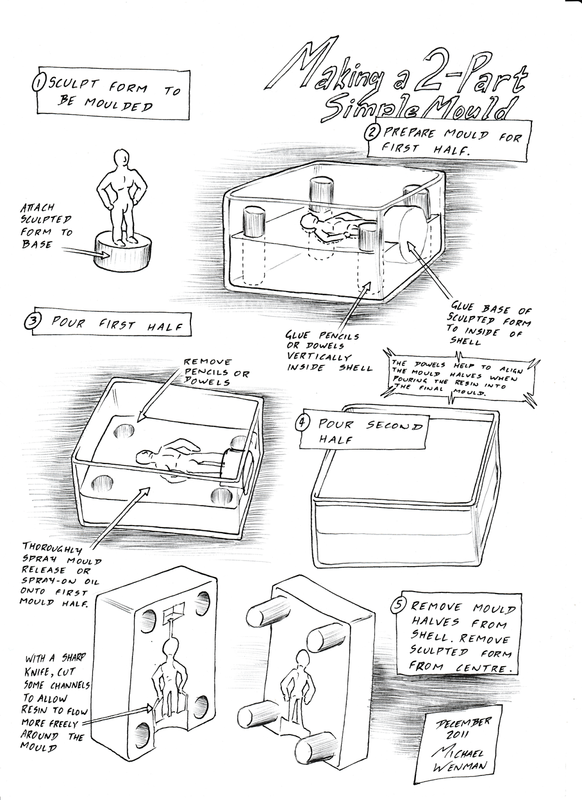 A few years ago, someone asked me fr a quick guide to my methodsfor creating resin moulds and casting with resin. I wrote them up these two sheets. Today's effort cleaning up some old paperwork found all sorts of documentation, sketches and notes. I'm not sure if it's been previously posted (in fact, I'm pretty sure that I haven't posted it), and since people seem to like my tutorials I figured I'd make sure it made an appearance. This is just one of many things that may be making an appearance over the next couple of days. 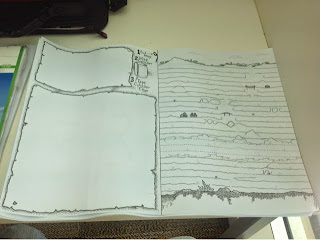 Working on the text for the "One Page Dungeon"
Making one loop of the pit is treacherous and slow work that takes two hours. 0 A number of harpies equal to half the current pit level attack. 1 A harpy attacks. 2 Slippery slope (mark this on the map), succeed in a dexterity/reflexes check, or suffer injury when you drop 10 metres/30ft to the next pit path. 3 Slow ground (mark this on the map), this ground is rough and takes twice as long to pass. 4-5 Nothing happens 6 You find a secluded space suitable for camping (Mark this on map). I totally didn't realise that we were most of the way through the One-Page Dungeon contest, so I've started scribbling some ideas down. An ancient and degraded pit carved into the ground long before anyone can remember, there is a long winding spiral pathway from top to bottom (and a few settlements that see just enough traffic from travelling adventurers to remain viable trading posts). The walls are riddled with mines and caves, and journeying into one of them may lead you through a labyrinth and out through another. Mystic energy and swirling vortexes mean that travellers generally cannot fly down the shaft, and even if they do risk the winds, there are nests of harpies and other dangerous creatures also willing to take that risk for a quick feed. Going into the caves can be just as dangerous. More shading, and some quick text rules to explain how it works, and it will be ready to submit. How much can you say without words? It's not a lot but context is important and can turn a simple phrase into something funny, deep, confusing, or serious. Between studying Pragmatics (the use of language in context), and the current 200 word RPG design contest, I'm really thinking about ways to maximise the use of language by providing a quick context, then minimising the remaining word count. I'm wondering if it would be too much of a cheat to use images and iconography to get meanings across, it would certainly do the job effectively...but are the images just a proxy for words? Hmm... This could get dangerous. This one's more of a storytelling game than an RPG, with players taking the roles of Spirit-imbued Relics trying to convince a thief that they need to get away from the treasure hoard and back into circulation in the world. There's this thing going around at the moment where people try to write a game or a supplement for an existing game with a maximum of 200 words. With all the pocketmod work I've done over recent years, this might be an interesting challenge (rather than a simple exercise in futility). Maybe write the whole thing up as a pocketmod with two or three sentences per page. ...it's been almost a year since my last post there, and I opened my last post with a comment like "Wow, I can't believe it's been a year since I posted here". Character Generation Other strangeness uses two methods to define characters. The first method is static, it defines the flat unchanging physical capacities of the character, such as their mutations and inherent aptitudes. The second method is dynamic, it defines the progress and advancement of a character as they are exposed to new lessons and integrate new knowledge into their understanding of the world. Start with 6 points in the general progress path.